Unlock Nokia Asha 300 - Safe IMEI Unlocking Codes for You! Unlock Nokia Asha 300 Handset! In case your Asha 300 doesn't ask for the code and there is no designated field to enter it, please DON'T PLACE ANY ORDER, contact us first for support. Instant unlock service for your Nokia Asha 300 mobile phone! NO technical skills required! Our codes works for the latest models, inlcuding Nokia Lumia 900, 800 ,710, Nokia C3, Nokia N8, Nokia 5230, Nokia X7 and others! See here Our Nokia List! Note 1: Please make sure you have a USB cable before placing your order if have ever tried before to unlock your handset. If you get the message “Not allowed”, “Phone Restriction” or “Hard locked” after you inserted the unlock code, it means that you have tried for many times to unlock it by inserting an incorrect code!. If this is the case, you will have to use a software that we will provide you which will require a USB cable. There is nothing to worry about if your Nokia Asha 300 its a brand new one! How to Unlock Nokia Asha 300 Phone - Tutorial! Please find bellow a step-by-step guide to follow in order to unlock your Nokia Asha 300. If your handset doesn't ask for the code and there is no available field to enter it, please contact us! can unlock nokia 300 imei: 355180054810768 LOCK STATUS: CONFIG KEY: 2720300000000000 Provider: Meteor;Ireland Key Code count: 2, FBUS Code count: 0 Block 1: Lock 1: CLOSED -> Lock Data: 27203F Loading INI list... 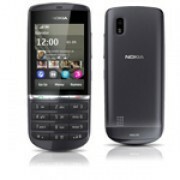 Detected P-KEY: 90009699 P-key nokia module version 01.02 Init usb communication... Reading product code... Product Code: 059N552 Searching for JAF saved location of ini... Checking path: C:\Program Files (x86)\Nokia\Phoenix\Products\RM-781\ Searching for default location of ini..